In the Pilot, drag the drawings on the layout. 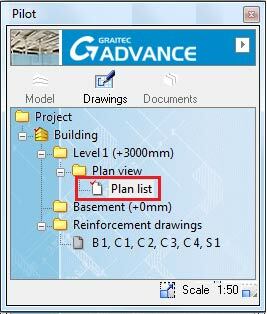 Select "Create a list..." from the "Advance List" toolbar or from the "AC:Drawings - List" multifunction tab and, then, select the desired view window. Place the list on the layout. 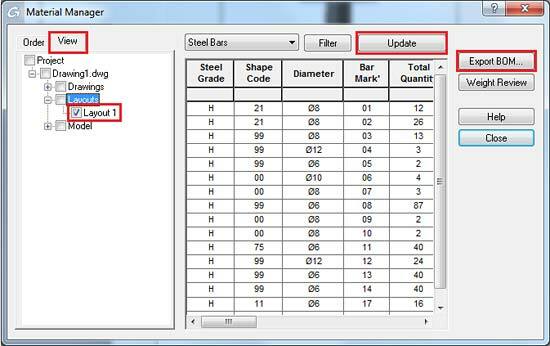 You can adjust the list by selecting another template or by setting the scale of the list and that of the bar and mesh bending details. Drawings are grouped together in the "Drawings" module. In the Pilot, activate Drawing A and drag Drawing B over the first drawing. Place the second drawing in the first. Group in this manner all individual drawings to create a complete drawing. Create, if necessary, a new numbering, to avoid double numbers. Create a material list in the complete drawing. Click "Create a list" and follow the instructions on the command line (what should be presented in the list, how are the elements selected, etc.). Place the list on the drawing. 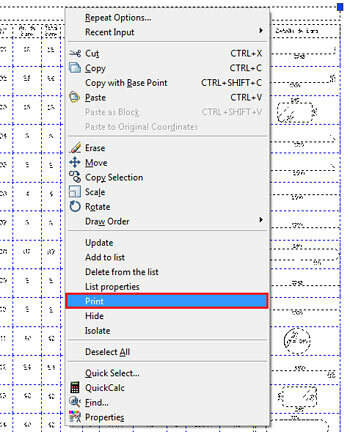 By right clicking on the list you can select the "Print" option from the context menu and print the list on an A4 sheet. Drag the complete drawing on the layout. Drag one more time the complete drawing on the layout. Using grip points you can dimension the view window, so that in a window only the drawings are visible and in the second window only the list. Advantage: Lists can be directly printed on an A4 sheet with the print command. Disadvantage: the 3D power cannot be used for grouped drawings, the creation of the layout is difficult. 3 - Creating lists for a layout with the "Material quantities manager"
Create a layout with the desired reinforcement drawings. Create in the "Drawings" module an "empty drawing" and name it correspondingly. Open the "Material quantities manager". Select the "View" tab in "Material quantities management", then select the desired layout. Click "Update" so that the data are displayed in the preview window. Then, click the "Export BOM..." button. A window will open in which the issue of the list can be selected. 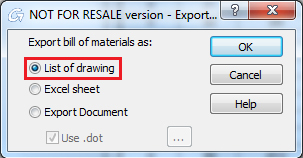 Select "List of drawing", click "OK" and place the list in the drawing. The list can be adjusted using the Smartbar. For instance, another template can be selected. The list is placed in the drawings, thus it can be printed directly on an A4 Printer by clicking "Print".